(Phys.org)—V3Solar has developed a new way to convert the sun's energy into electricity using traditional technology in a new way, and in so doing have discovered a way to get twenty times more electricity out of the same amount of solar cells. Their new device, called the Spin Cell, does away with the traditional flat panel and instead places the solar cells on a cone shaped frame which are then covered with energy concentrators. Once in operation, the whole works spins, making unnecessary the need for tracking hardware and software. What's more, they actually look nice. Up till now, virtually all solar arrays have been based on flat panels with solar cells mounted on them. The panels are mounted on poles which allow for tilting to track the sun as it passes overhead in the sky. This new approach turns the old idea completely on its head. Because of the great potential of solar energy, researchers have looked into increasing the efficiency of solar cells by using lenses or mirrors to direct more of the sun's energy onto them hoping to get more electricity out of the same number of cells. Unfortunately, doing so tends to create so much heat that the cells become useless. 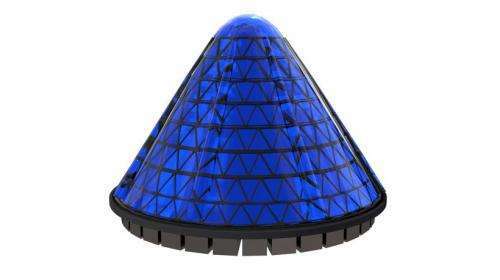 The engineers at V3Solar took this idea and modified it to prevent such overheating by mounting the cells on a rotating platform; doing so means that each cell only receives extra heat for a very short amount of time and is then allowed to cool as the cone spins. The concentrators form an outer skin creating a hermetically sealed inner environment for the triangular shaped blue colored solar cells. The cone is situated on a base of electromagnets powered by some of the energy that has been converted from the sun's energy by the solar cells, creating a nearly frictionless spin. The result is a marvel of engineering and an artistic triumph – a means to produce much more electricity than traditional flat panels in a pleasing, and as the company says, beautiful way. The only shadow on this bright idea might be the price. The company hasn't said just yet how much each cone will cost, but surely it will be far more expensive than a flat panel. The question is, will the cost for one be equal to or less than twenty traditional panels, making them cost justifiable? Only time will tell of course, but in the meantime, no doubt many will have their fingers crossed as the cones actually look like something out of a science fiction movie, and that will surely be reason enough to have many rooting for them. I do not see all the solar concentrators. To get 20 times the efficiency, you should need solar concentrators that are 20 times larger than the solar cells themselves. But, I do not see them? Also, you may be able to concentrate direct sunlight, but diffuse sunlight will not be focused so easily. So, the cone can only be used in regions where clouds are uncommon. You're right hb. You should write them a letter to tell them how unjustified all their claims are. You are ridiculously smart. The surface area of the lenses concentrating light are semi-conical, so it looks smaller than it is. According to their website, however, they state that they see 5X more power with a 50% cost reduction per watt. So physorg may be pulling that 20X number out of nowhere. Unless they're talking about voltage, which could be possible compared to some flat panels. Although I wouldn't really call it "electricity" in that context. Freakin' gimick. Designed to attract investors, not get real energy. too many moving parts to deploy en masse. Yeah, clothes dryers must have too many moving parts to deploy "en masse" too huh? I think the 20X figure just reflects the fact that they are concentrating the light, so each cell produces 20X what it would otherwise if it was exposed to the sun directly. Obviously they can't exceed 100% efficiency. If they used triple junction cells they might be able to get around 40% efficiency. The spinning device has concentrators on the surface. Its using far less silicon per footprint than a flat panel. Thing is people are already researching concentraded pv using all sorts of concentrators and using pv other than established mono and poly silicon. The catch here is only that the device spins to keep itself cool. Excess heat and wear is the big problem resulting from the necessary approach of concentrating light to bring down material costs. Pv panels in space recieve concentrated sun ( and excess uv) without atmospheric blocking amd they wear out far quicker than pv on the ground. Spinning might be a great solution. Ultimately the composition of the material determines how much heat and tolerance/wear it can take. However any technology....like biological organisms themselves will operate optimally usingan optimal mix of composition, behavior, etc....it is posdible that spinning is a superior but will consumers put spinning Heavy devices on rooftops? I would add that while they look nice....spinning might make a big problem with ice and wind and what about cleaning this? "To understand V3, resonance is the key. "V3 utilizes a series of precisely "timed events to build these waves of energy into more electricity than their individual components." "With appropriate lensing, our 1000 watt Spin Cell is expected to use less than 0.20 square meters of 20% efficiency PV as the sunlight is concentrated 20X and efficiency is increased." "Imagine a 1MW solar farm requiring approx 7 acres with flat panel solar. With V3, the same energy output requires less than half an acre, saving on land cost, maintenance, weed control, cleaning, framing and other expenses." I'm afraid this is snake oil. Read the crap about resonance on their website. So, they concentrate the energy 20x but somehow do this using 1/2 acre versus 7 acres. WOW, 20 * (7/0.5) = 280 times improvement. Since their cells aren't tracking the sun, only a small portion of the cells on each conical section will get any sunlight unless the sun is directly overhead. Usually only marketing spins a product...looks like engineering got involved this time. "What is the cost in dollars/KWhr installed?" and what is the differential it will maintain this for at least 10 years ? Currently panels are 15 to 20 percent efficient. The efficiency claims are therefore nonsense. The rational core of this idea is, that the solar cell is behaving like the diode with exponential current/voltage curve. So that the stronger illumination is, the better yield we get, until the solar cell will not become too hot. The natural solution would be to use the concentrator and some cooling system, which would utilize the waste heat. But V3Solar did choose the very strange solution, in which the effect of concentration gets dissipated with rotation of collector. So that few cells are working intensively and effectively - whereas the rest of cells doesn't work at all at the price. IMO the thorough calculation would reveal, that this solution is economical nonsense, as the substantially higher price of these collectors indicates already. The same applies to various "solar trees" and another collector constructions, which are sensitive to wind and difficult to maintain. We discussed it here already.. This construction rather serves as an illustration of the Darwinist character of the evolution of engineering and technology, which doesn't go through optimal solution in straightforward way. But it rather tries all less or more meaningful solutions first like the mutations, which are getting tested in competitive environment. In accordance to my experience, that the people will use the correct solution just after when they fail with all these wrong ones. The mainstream science is not any better in this regard - such a blind approach helps the employment of various people, who are working frenetically on realization of solutions, which are predestined to fail in my eyes. This is an interesting aspect of human civilization, it never forgets its evolutionary roots. I would even accept it - but in this particular case the material savings is traded off for apparent material waste: the expensive silicone cells are saved just with the redundancy of expensive silicone cells, the majority of whose remains unexposed to direct sunlight and wasted in such way. So sorry - but it isn't beautiful, but sorta comical solution. In fact wind could be a good complement for this thing. Once installaed you have already paid for the electromagnets, a spinning surface, a conexion to the grid, transport and installation, which makes 95% of what is needed for a wind turbine. To start with, you could just orient the collector semicilinders in opposite directions on each half of the cone, to make it work as a Sabonius wind turbine (an "S" shape) without additional cost or complexity. It is not very efficient for a big turbine, but the lack of any orientation requirements make it ideal for turbulent areas, like houses in a town or to attach them on top branches of trees. The profile of this device exposed to the sun is approximately equal from dawn to dusk. The concentrators avoid low performance during low light times. The spinning avoids overheating due to concentrators. The while device is encapsulated in an immobile clear dome that has the concentrators at part of it's shape. The increased profile over the course of the day will likely give a great improvement in performance vs. immobile flat panels. Much less of an improvement vs. tracking panels. Depending on how simple this design is internally, it could be less costly than tracking panels. Being sealed, it would likely have much less maintenance. All the while still having an improvement in efficiency due to improved exposure during the day. By my observations, there is a good chance that this is worth while. Not guaranteed. I would very much like to test these for myself. Though, I admit that their marketing and explanations are still very poor. "This electricity is then conditioned by the power electronics, transferred to the electromagnets in the base ring. As these spin past the electromagnets in the state array, AC power is produced"
Okay, maybe this is just too obvious. Couldn't you more than double the efficiency just by strategically placing some mirrors around it, or creating a concave (focal mirror) "bowl" for it to sit in? Sheesh. I should patent this idea myself and take away their toy altogether. Anyone with me? With all this spinning internal electronics the electrons will get confused and won't know which way to flow to get outside. They will act like drunken Republicans trying to get out of a Republican convention who need the help of common street hookers to show them the way. Never question magic, or someone trying to sell you a bridge. Not even UbVonTard is stupid enough to fall for this device. I was expecting the video to say "and the spinning creates a centrifuge effect that forces those pesky electrons out and into your wires!" ..you have already paid for the electromagnets..
A pretty ornament for the coffee table. The idea requires that the cells have time to cool off significantly before their next turn into the sun. That this happens is not automatic, it depends on how the heat is removed. Introducing moving parts to each cell raises reliability and cost issues. Looks like smoke and mirrors to me ! Once the cost is available it all looks too reliant on mechanical energy which has to come from somewhere. 1) concentrators work like this: large concentrator - small PV cell. This means that you do NOT plaster 100% of the available area with PV cells (since then there would be no point to a concentrator). The point is that you use (20x) less PV material for a given area of sunlight. It does NOT mean that you get 20x more energy per area. It means you get 20x the energy per PV material(!) area used. 2) Weather: The concentrator (on the outside) is stationary - only the cells rotate (on the inside). So the cells or any moving parts aren't exposed to weather at all. 3) Moving parts: A magnetic bearing has none. Cost per KWhr installed ? Derating for time and temp ? What power is lost through the 'electromagnets' ? I dunno. All the things I said are pretty clearly spelled out in the second paragraph. That would depend on the PV material used. Magnetic bearings are virtualy maintenance free. We're still talking concentrators and there is possibly some other effect due to constant heating/cooling that will degrade the cells faster than unconcentrated ones (though probably much less so than stationary concentrated ones). And since the amount of PV material is small replacement every 10 years or so should still be economical. The inverters are actually a main factor in MTBF - and since this design needs none that's a big plus. Not much. Once this thing is up to speed there is not much that is slowing it down. The bearing part is done with permanent magnets. The electromagnets are for maintaining spin and AC generation, only. If it doesn't have moving parts how does the electricity get off the rotor? If the cells are in a rotation with X duty cycle in the sun then why not decrease the concentrators by X and not rotate at all? This raises a few 'opportunities'. a. Depending on the average PV piece 'quality' the higher concentration might allow (some) previously junked bits to be used effectively. The Moon Men have a large version of this device as was proven years ago by the first men to visit the interior of the moon. "'a) x times more PV cell (which is what they are trying to avoid)""
No i don't think so. Isn't the premise that the cells are exposed only briefly to the concentrator as they rotate. If so stretch them out and irradiate them constantly with lower intensity light. Good point about the tracking not needed though. How does this system get by without an inverter. How does it get the power out from the rotating cells. I didn't see that part in the article. Concentrated PV cells are available with ratios beyond 100:1. So if they use similar concentration ratios and have their cells exposed only a fifth of the time (due to the rotation) then they get a ratio of 20:1. How does this system get by without an inverter. It uses an AC alternator which is pretty much a freebie, since the contraption turns. The bearing part is done with permanent magnets. They say this is maglev, really ? Isnt that rather power hungry, besides magnetic bearings cant take large lateral loads, such as wind etc ? The Duty cycle in relation to specific heat vs the static panels doesnt quite factor, it would be cheaper to have conventional array with a rotating reflector ? I've seen 20 year old flat panels tracking the sun nicely with gaseous gas/water trackers, once set, rather, Reliable ! The 'spin' in the first minute or so of the first vid above is a bit 'non technical' & implied definitions of 'effects'. But seriously, who can say what the dollars/KWHrs installed actually are ? Well, I'm not sure about the claims, but cooling a PV cell definitely increases it's efficiency. Dan Rojas, on Greenpowerscience, proved a 10% gain in power output (coresponding to about an additional 1% vs ideal efficiency,) by cooling a PV panel by totally submersion in water in an aquarium, this is even after the losses from the impeding glass and water. However, I'm not convinced that air cooling of a panel via rotation would be enough, but then again, if it's rotating around a cylinder or cone, each cell should receive on average 1/4th as much heating as if it was permanently fixed on the Sun, thereby radiating away waste heat in teh same way the Earth itself does. Of course, when the Sun is directly over head, the cooling theory doesn't even work anyway, and then you have sub-optimal angle of incidence of hte radiation. I question the real world cost effectiveness of this vs cheaper, passive cooling alternatives. Just submerge panels in air-tight water box with in/outflow. I see, concentrated sun like with a magnifying glass. Maybe we can call the company Solynder. Bob Yirka, the author, claims, "I did manage to get a Bachelor of Science Degree." "Managed" is the operant term. They must have waved the requirement to pass Physics 1A? This publication date should read April 1st. Heating/cooling is nonlinear. How much an object heats/cools is determined by the tmperature differential you expose it to. High differential: fast cooling (heating). :hmmm: "A water wheel that never dumps its buckets" vs 'what?' great tricknology lingo that ! And "Spinning disk makes the photons dance" - WoW ! Anyone prepared to offer a 'back of the envelope' type differential analysis ? The cone speed - is it synchronous with mains freq, what if the wind wants to speed it up too much, wont that then drain power from the mains keeping its speed down etc ? And the converse, what if the delta wind direction etc want to slow down the rotation rate, wont this just chew up solar power ? Too many questions with too much spin, we need real hard numbers with good experimental methodology ! With desperate magical rubbish like this on the market to lure gullible investers into financial disaster, is it any wonder the global solar PV industry is already imploding due to its technologial failure to compete with the unmitigated environmental evils of pervasive fracking and cheap coal? "The result is a marvel of engineering and an artistic triumph..."
That isn't reporting, it's repeating a company's PR release. We don't need phys.org to be another PR website. Please stay objective. Cone-shaped solar cells aren't new, but developing a way to fabricate them inexpensively has been a sticking point. Looks like V3 Solar is trying to get around the price-point problem by increasing the light falling on the cones, which produces operating temperature woes. But rotating the cones to avoid overheating them means that each cone is receiving light and generating electricity only briefly. That's an efficiency loss. They're also wasting heat like crazy. How do their efficiency versus cost numbers stack up against steam-generating collector arrays? That's the interesting comparison, not to flat panels. Conservative don't live in the reality based universe. The price of flat panels out of China is about $2.5/W, cheaper than coal. The problem is storage, I need lights at night.